As a power solution expert SOROTEC is dedicated to continuously designing, manufacturing, marketing, and introducing a complete line of UPSs, inverters, and solar power products to the demanding power market. Model REVO-II, SSP3111C, SSP3119C and so on. We sincerely invite you to the SNEC PV POWER EXPO 2018 at the Shanghai New International Expo Centre on May 28-30， 2018. We are looking forward to your coming at E6-129 130. Our team is ready to serve you by professional attitude and excellent team spirit. The 2018 edition of Solar Pakistan will takes place at Lahore Expo Centre from 29 – 31 March 2018. SOROTEC will attend the Solar Pakistan and we sincerely invite you to visit us at Hall # 2 Booth No.2-084. We will exhibit our newest REVO series, Solar Charge Controller & Solar Inverter products at our booth. 2.PV and utility power take the load at same time (can setting). 3. Output power factor PF=1.0. 4.On/Off grid with energy storage. SOROTEC is a High-Tech Enterprise which specialized in Research, Design & Manufacturing of power products. With more than 10 years experiences in overseas and domestic market. SOROTEC is committed to providing high quality products with competitive price and cordinated service to meet diverse requirements from customers. Mar.6-8, 2018, SOROTEC successfully exhibited in the Solar Middle East at Dubai World Trade Centre. As a professional power solution expert, we presented many of our newest products on the booth, for example: On/Off Grid REVO II Series Hybrid Energy Storage Inverter, 48V Solar Power System for Telecom, Pure Sine Wave Solar Power Inverter, MPPT Solar Charge Controller and High Frequency Online UPS on the exhibition. 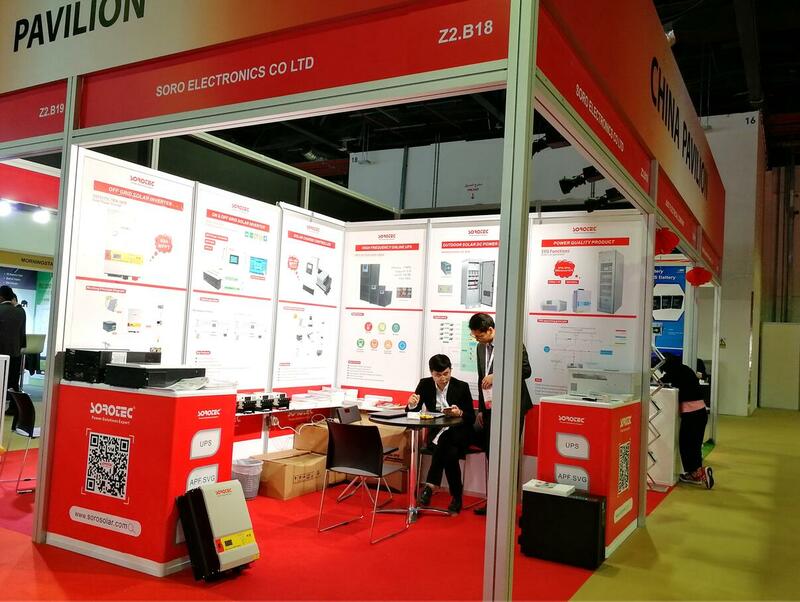 A lot of clients visited SOROTEC’s booth during the exhibition, They showed a keen interested in SOROTEC ‘s new products, and they konwn more details of SOROTEC’s products with the help of our technicians and sales person, many customers show a stronger desire for cooperation. Thanks for all clients visiting our booth and sharing the products with us. In the future, we will continue to provide high quality products with competitive price and try our best to meet diverse requirements from customer. Thank you for your visiting and wish SOROTEC a success in the next year. SOROTEC will attend the Solar Middle East exhibition (Mar.6-8, 2018) at Dubai World Trade Centre. We sincerely invite you to visit us at Solar Hall Booth No.Z2.B18. We will exhibit our newest REVO series, Solar Charge Controller & Solar Inverter products at our booth.